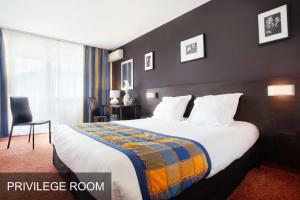 Just a 3-minute walk from the sea, Quality Hotel Menton Méditerranée is located in the town centre. It offers a panoramic terrace with a fitness area and sun loungers. 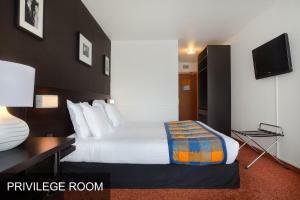 A minibar and an LCD TV are basic facilities in the rooms at Hotel Méditerranée. 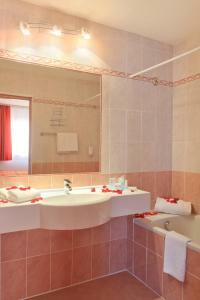 Each is air-conditioned and has a private bathroom with a bathtub and a hairdryer. Most rooms have a large balcony. Le 5 brasserie-style restaurant offers a traditional menu with Mediterranean and Provencal flavors. The chef prepares balanced meals and homemade desserts, often using citrus fruits from Menton. Wi-Fi is available throughout the hotel and underground parking is offered at an additional cost. Menton Train Station is a 10-minute walk away and the hotel can be accessed from the A8, 7 minutes away.